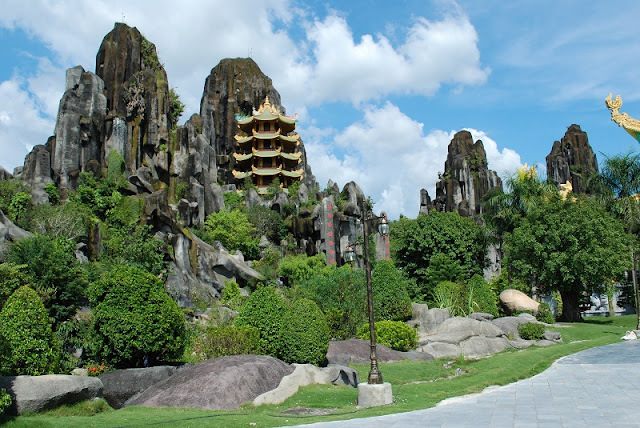 Driving 9km south of Da Nang city center on the famous beachfront boulevard Truong Sa, travelers can find one of the most popular attractions of the region, the Marble mountains. It is a group of five limestone mountains, named after the five elements of the ancient oriental philosophy: metal, wood, water, fire and earth. These mountains have a complicated system of caves and tunnels. In the past they were used as hiding places and important bases for Vietnamese revolutionaries. Among the five, Thuy Son, the mountain of water, is the highest and also the main attraction. Almost all tourists come to Marble Mountains to climb Thuy Son. This mountain has many caves and Buddhist temples, many dating back to the 17th century. Climbing up about 150 stone steps from the foot of Thuy Son, one will reach the most beautiful observatory spot: the Riverview Tower or Vong Giang Tower. The tower was built in the 18th century by Emperor Minh Mang, offering a breathtaking view to Kim Son or the mountain of metal, Truong Giang, and Cam Le rivers and beautiful coast. Tourists may also want to visit the Non Nuoc Village at the foot of Marble Mountains. The village is famous for stone sculptures and handicrafts. Here you can buy many things made of marble stone, from small one like earrings, necklaces, vases to the huge sculptures of Buddha. 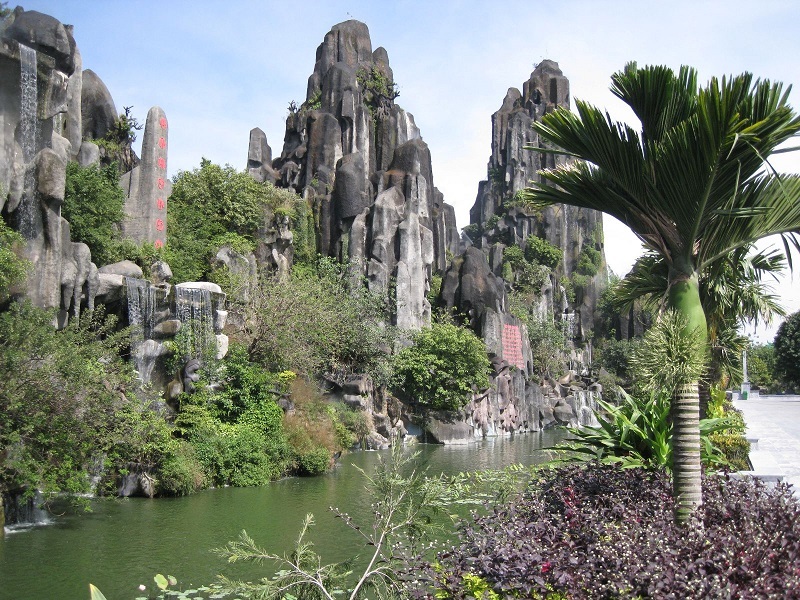 In the past, rock was extracted directly from the Marble Mountains to make sculptures but now the direct extraction is illegal. Materials for sculpting work are now transported from nearby provinces like Quang Nam and Thanh Hoa. 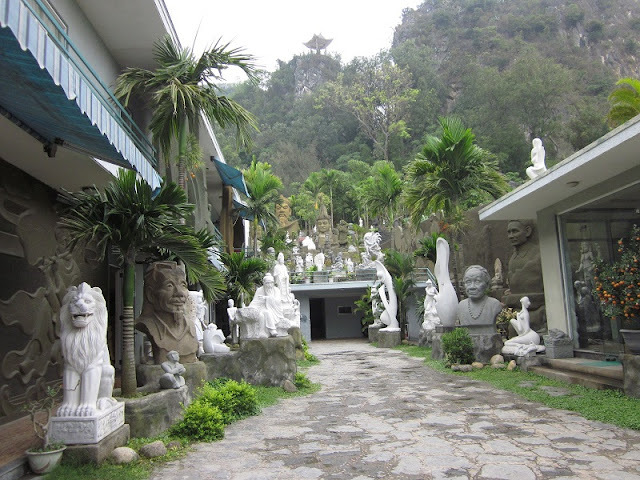 From Da Nang city center, tourists have plenty of choices to get to Marble Mountains. Either book a tour or take a taxi, or even a motorbike-taxi. It only takes a few minutes. From Hoi An, drive north 20 km and you will see a big sign saying Marble Mountain.